The Clarke Historical Library recently acquired eight letters relating to the removal of the Potawatomis to reserves west of the Mississippi River in the year 1840. Six of the letters are addressed to Gen. Hugh Brady, who was responsible for arranging and overseeing the removal. Two are letters Brady himself wrote. 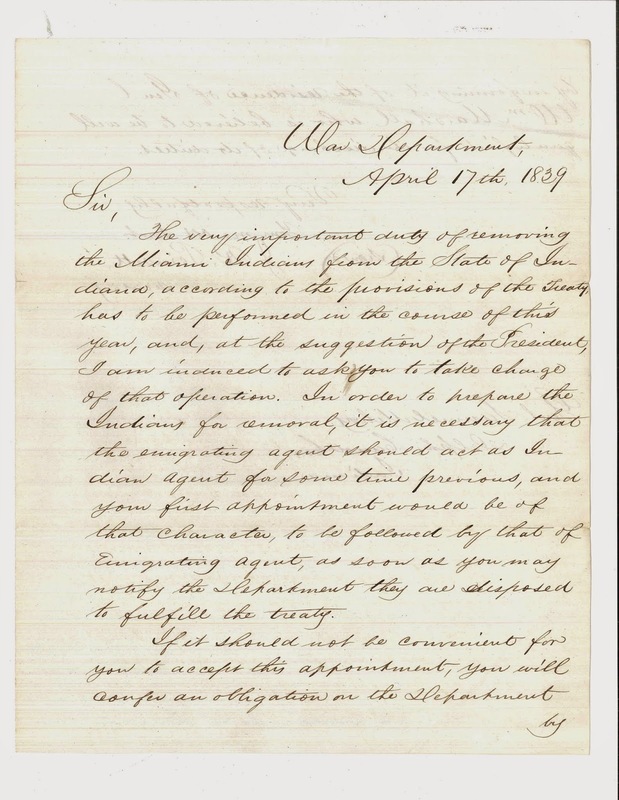 A ninth letter, which the Secretary of War addressed to General Samuel Milroy, was written a year earlier and concerns the removal of the Miami Indians from the state of Indiana. The letters reflect the progress of events leading up to the forced removal of the Potawatomis that took place in the fall of 1840. The Potawatomis inhabited the country surrounding the southern end of Lake Michigan. A numerous people, they lived in villages throughout what is now southern Wisconsin and Michigan and northern Illinois, Indiana, and Ohio. During the War of 1812 they, like most of the tribes of the upper Mississippi valley, had allied themselves with the British. American expansionism after the war only served to inflame the already smoldering anger Indians in the region felt toward white Americans. Such sentiment gave rise to several killings and in 1827 to an uprising of the Winnebagoes. Fueling Indian anger, scores of white miners were moving onto mineral-rich Indian lands along the Mississippi and working the lead mines there. In 1828 squatters moved onto lands around Saukenuk, a principal village of the Sauk and Fox Indians on the Rock River. 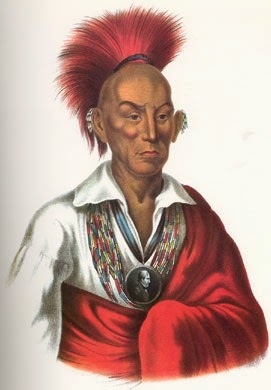 To control the situation, the U.S. government tried to secure land sessions from the Sauk and Fox, but the "British Band," under the Sauk leader Black Hawk, resisted American pressure to leave Saukenuk. In June of 1831 U.S. troops and gunboats stationed themselves at Rock Island opposite Black Hawk’s villages at Saukenuk and forced the Sauk and Fox to flee across the Mississippi into Iowa. The following year, in April of 1832, starving, Black Hawk’s band, numbering 1100, including 100 Potowatomis, re-crossed the river and returned. The next month Illinois militia attacked the Sauk and Fox at Stillman’s Run and set off what came to be called the Black Hawk War. Other Native American leaders found themselves in difficult circumstances. Many sought neutrality while feeling sympathetic to Black Hawk's cause and providing Black Hawk and his followers clandestine assistance. The Sauk and Fox themselves were divided. Keokuk and the majority split with Black Hawk. They feared the superior force of the United States and the consequences of what would follow if they took up arms against the Long Knives. On the other hand, the Sioux and the Menominees saw the war as an opportunity to avenge earlier deaths and to strike a blow at their traditional enemies. Though sympathetic to Black Hawk’s cause, most Potawatomi villages remained neutral during the course of the war. While some warriors sided with Black Hawk and fought against the Americans, Potawatomi leaders Billy Caldwell, Alexander Robinson, and Shabonna pursued a policy of neutrality. To prove their allegiance, these Potawatomis in the course of the war openly allied themselves with the United States. Even so, white Americans had not forgotten the Potawatomi attack on the garrison of Fort Dearborn during the War of 1812. This and more recent acts of violence by those who had joined with Black Hawk provided whites with all the excuses they needed to drive off the Potawatomis and to seize their lands once Black Hawk had been defeated. During the decade of removal (1830s), the Potawatomis employed various strategies to keep from being expelled from their homelands. If they could not avert removal altogether, their aim was to hold onto what they could. The Potawatomis of southwestern Michigan were especially set against removal, and more than one attempt at their removal took place. Removal was a chaotic affair, characterized by delays, misdirection, governmental changes of plans, desertions and returns, sickness and disease. A forced removal in 1838 led to the “Trail of Death,” where food supplies spoiled and a third of the 850 men, women, and children en route caught typhoid fever, forty-two souls dying along the way. The very important duty of removing the Miami Indians from the State of Indiana, according to the provisions of the Treaty, has to be performed in the course of this year, and, at the suggestion of the President, I am induced to ask you to take charge of that operation. In order to prepare the Indians for removal, it is necessary that the emigrating agent should act as Indian Agent for some time previous, and your first appointment would be of that character, to be followed by that of Emigrating Agent, as soon as you may notify the Department they are disposed to fulfill the treaty. If it should not be convenient for you to accept this appointment, you will confer an obligation on the Department by informing it of the residence of Genl. Wm. Marshall who is believed to be well qualified for the discharge of its duties. R. David Edmunds, The Potawatomis: Keepers of the Fire (Norman: University of Oklahoma Press, 1978) remains one of the best accounts of the Potawatomis. See also, James Clifton, The Prairie People: Continuity and Change in Potawatomi Indian Culture 1665-1965 (Lawrence: The Regents Press of Kansas). For the Black Hawk War see Patrick J. Jung, The Black Hawk War of 1832 (Norman: University of Oklahoma Press, 2007) and John W. Hall, Uncommon Defense: Indian Allies in the Black Hawk War (Cambridge: Harvard University Press, 2009). See Ann Durkin Keating, Rising Up from Indian Country: The Battle of Fort Dearborn and the Birth of Chicago (Chicago: University of Chicago Press, 2012). Susan Sleeper-Smith, “Silent Tongues, Black Robes: Potawatomi, Europeans, and Settlers in the Southern Great Lakes, 1640-1850 (PhD diss, University of Michigan, 1994). This is an excellent treatment of the Potawatomis. See especially chapter V ‘Accommodation Removal.’ For the forced removal of 1838 see pages 188-90. Samuel Milroy, who spent his childhood and youth in Pennsylvania, had a colorful ancestor. His great grandfather, John McElroy, the Earl of Annandale, fled Scotland at the time of the second Jacobite Revolution, escaping first to Ireland and then to the colonies. At the time he changed the family name to Milroy. Samuel Milroy left Pennsylvania for Kentucky in 1809, married Martha Huston there, and moved with her to Washington County, Indiana. In the War of 1812, he rose to the rank of general in the Indiana militia. After the war he moved his family to northern Indiana where he named and platted the town of Delphi. The Miamis spoke an Algonquian dialect. Prior to the deportations that took place in this period, they lived in present-day Indiana, southwest Michigan, and western Ohio. See Stewart Rafert, The Miami Indians of Indiana: A Persistent People 1654-1994 (Indianapolis: Indiana Historical Society, 1996); Bert Anson, The Miami Indians (Norman: University of Oklahoma Press, 1970); http://en.wikipedia.org/wiki/Miami_people. Poinsett was referring to the 1838 treaty, which the former commissioner, Abel C. Pepper, had signed with the Miami. 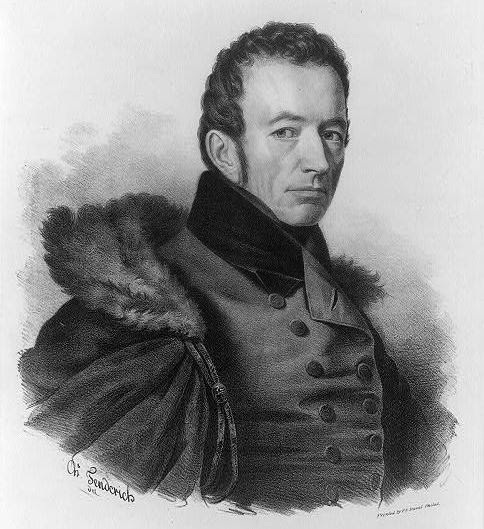 Poinsett probably wanted the emigration to occur “in the course of this year” so that it was completed before the next Congress met in session, i.e., before December 2, 1839. Article 12 of the treaty stipulated that the treaty had to be ratified in the next session of Congress otherwise it would have been considered “null and void.” Poinsett may not have wanted to risk losing the chance for removal should Congress fail to ratify the treaty. The Miami surrender of land took place on the 28th of November 1840. What was left of the Big Miami Reserve, where village ownership had prevailed, was ceded in the treaty, requiring the emigration of half the tribe. The Miamis agreed to emigrate within five years. The treaty was signed by twenty Miami leaders and two representatives of the United State: Allen Hamilton, and Samuel Milroy. Milroy’s two sons, Henry and Robert, were among the witnesses who signed the treaty. William Marshall (1786-1859) served as the agent at the Indiana Indian Agency from January 1832 until July 1835 when the agency was discontinued and the duties of the agent were assigned to Abel C. Pepper, the Superintendent for Emigration in Indiana. The agency was located on the Wabash river at Logansport, Indiana. When the Black Hawk War broke out, agent Marshall gathered many Potawatomis to Logansport to protect them and to pacify settler fears and anger. In 1834 Marshall was instructed by Secretary of War Lewis Cass to secure for the United States Potawatomi reserves still in Indian hands. 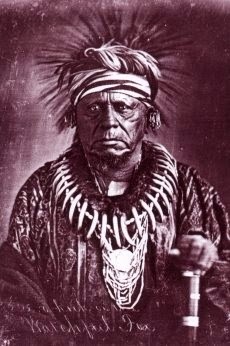 Marshall treated with the Potawatomis, and by December of 1834 he had purchased from them 52,800 acres of land. As in this letter, Marshall is often referred to as General, possibly from service in the militia during the War of 1812. In 1818, President James Monroe appointed Alexander Wolcott Jr. MD (1790-1830) to serve as agent at the Chicago Indian Agency, one of nine agencies under the direction of Gov. Lewis Cass, Superintendent of Indian Affairs in the Michigan Territory. Cass placed great confidence in Wolcott. In 1820 Wolcott accompanied Cass on an expedition to the headwaters of the Mississippi River. The following year he assisted Cass in negotiating the August 1821 Treaty with the Ottawa, Chippewa, and Pottawatomie Indians, which surrendered to the United States what is now the southwest corner of the State of Michigan. The contents of the following letter can be found in a small collection of Lewis Cass papers at the Clarke Historical Library. The majority of letters in this collection were written during Cass’s tenure as territorial governor and concern administrative matters. The letter presented here was sent by Alexander Wolcott to William Woodbridge. The transcription retains Wolcott's original spelling and capitalization; however, for the sake of readability, his punctuation has been standardized. 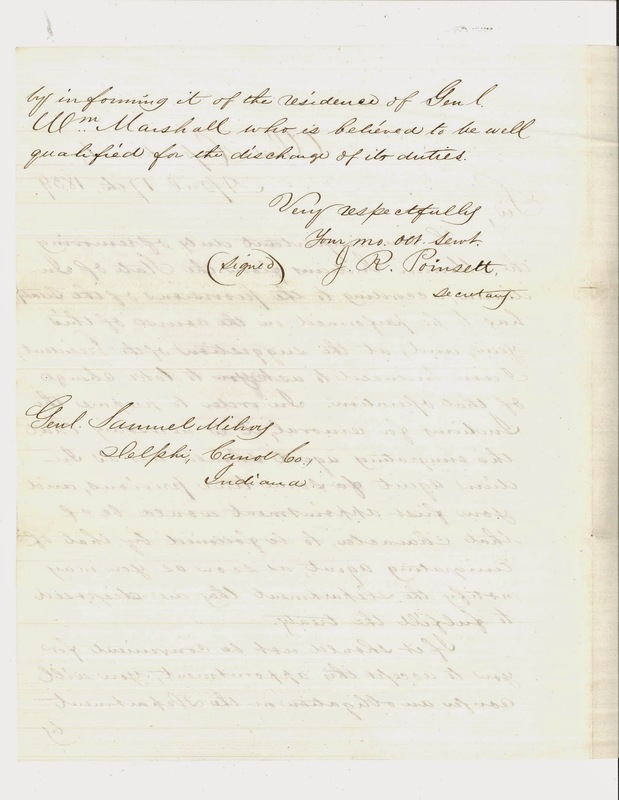 The letter centers on Wolcott’s efforts to purchase goods in Detroit for the Chicago Agency, and it testifies to Wolcott’s passion for public service, a passion that manifested itself even in routine endeavors. His enthusiasm for unremarkable tasks—being able to recognize these duties as part of something broader—set Wolcott apart. At the time, John Quincy Adams’s administration was under political fire to cut expenditures, and the Indian Department served as a prime target for such attacks. In purchasing goods at the markets of Detroit to save costs, Wolcott was looking for a way to reduce some of the budgetary burden facing the Superintendency. He was also lessening the exposure of the Indian Department. A loyal and capable manager, Wolcott remained the Indian agent at Chicago until his death at the age of forty. William Woodbridge, Territorial Secretary, was serving as Acting Superintendent in Cass's absence. Five days earlier Cass and retinue had left Detroit for Prairie du Chien, where Cass would conclude a treaty of peace among the Indian nations living in the vicinity of the Upper Mississippi River. For more information on Woodbridge see: Emily George, Michigan's Connecticut Yankee (Lansing: Michigan History Division, Michigan Department of State, 1979). Images of the Letter from Alexander WolCott Jr. to William Woodbridge. Gilpin, Alec R. The Territory of Michigan [1805 - 1837]. Lansing: Michigan State University Press, 1970. Miriani, Ronald Gregory. "Lewis Cass and Indian Administration in the Old Northwest." PhD diss., University of Michigan, 1974. Unger, Robert William. "Lewis Cass: Indian Superintendent of the Michigan Territory, 1813-1831. A Survey of Public Opinion as Reported by the Newspapers of the Old Northwest Territory." PhD diss., Ball State University, 1967. Clarke Historical Library 2009-2013. Simple theme. Theme images by Nic_Taylor. Powered by Blogger.